What if schools could offer teachers both shared professional learning experiences and personalized learning opportunities? Every June, teachers at Mariana Bracetti Academy, a Title I K–12 school in Philadelphia, assemble for their end-of-year staff meeting. The meeting includes the typical announcements about cleaning out classrooms and curriculum inventories, but the highlight of the event is a series of presentations led by the teachers and counselors themselves. These educators share details about the professional learning opportunities they'll be facilitating in the upcoming school year. Staff members then have an opportunity to select—from a menu of offerings that meet their preferences in terms of professional interests, scheduling, and learning formats—the professional learning experiences they will pursue the next year. Unfortunately, this kind of structure for teacher professional learning is somewhat unusual. As I collaborate with leaders and teachers around the world, differentiated student learning abounds in the form of flexible grouping, leveled reading, digital playlists, centers, and similar approaches. Many educators personalize students' experiences even further by inviting each student directly into the learning-design process, enabling the cocreation of lessons or projects. Yet teachers in these same schools participate in one-size-fits-all, "sit-and-get" professional development. Most PD plans still consist of one-time workshops and top-down mandates that don't integrate the components of personalization teachers are working to incorporate into their own classrooms. Even well-intentioned professional learning communities too often manifest as planning and grading sessions rather than true thought partnerships and peer-to-peer collaboration in which teachers push one another's practice. Teachers, rightfully, have begun to speak out against this one-size-fits-all system and form their own professional learning networks (PLNs), using tools like Twitter and Voxer, edcamps, massive open online courses, and blogs. Such networks not only connect teachers with peers beyond their school, but also provide on-demand professional learning in a variety of formats. As PLNs continue to thrive and take on new forms, so does the wealth of resources—text-based and digital—for professional learning and planning. However, while these free-choice learning experiences may help individual teachers, they do little to foster a community of professional inquiry within a school or district. And they depend on the drive and commitment of particular teachers. What if schools could both provide meaningful learning experiences shared by teachers within a school and offer teachers individualized opportunities? Research into the effectiveness of professional learning shows that the status quo needs to be reimagined. School districts expend massive amounts of financial resources and human capital on teacher professional learning, yet most of these activities have been found to have minimal impact on teacher learning and student achievement. A 2015 study by the Bill and Melinda Gates Foundation reported that "$18 billion is spent annually on professional development, and a typical teacher spends 68 hours each year … on professional learning activities typically directed by districts" (K–12 Education Team, 2015, p. 5). But despite this investment, the study found, only 29 percent of teachers are highly satisfied with their current professional development offerings. A separate study from the teacher-development group TNTP (2015) found that districts spend, on average, nearly $18,000 annually per teacher on development efforts and teachers spend more than 150 hours—10 percent of the school year—on PD. Yet only about 40 percent of teachers reported that the PD they received was a good use of their time. Most teachers' skills didn't appear to improve much from year to year. As the TNTP study noted, "All this help doesn't appear to be helping all that much." Both studies tried to identify the most effective forms of professional learning, but no statistically significant trends emerged, underscoring what educators have known to be true about effective adult learning for over 50 years—it's a highly personalized experience. In the same way leaders encourage teachers to form relationships with their students, they must recognize that coaching teachers and helping teachers stimulate one another's growth is "people" work, not "process" work. Strategic professional learning plans can help steer the course, but they don't get the entire crew rowing in the same direction with optimal force. Although a personalized professional learning model for educators within one school can seem overwhelming to plan, time-consuming to monitor, and challenging to maintain at a level of high quality, I've worked with many schools that have made it happen—without chaos. As Mariana Bracetti's example shows, leaders can take steps to empower teachers to take a significant role in their own learning experiences. One useful touchstone in this process is Bena Kallick and Allison Zmuda's "defining attributes" of personalized learning (2017). True personalized learning, Kallick and Zmuda assert, amplifies learner voice, offers opportunities for codesign, considers social construction, and encourages self-discovery. Let's look at how Mariana Bracetti—where I worked in various roles from 2006 to 2016—integrates these components of personalized learning. How does what teachers are asking for in professional learning opportunities differ from current practice? What constraints must be considered and overcome to provide the desired learning? Are there outliers whose needs may need to be met in a different way? How can we work as a team to make it happen? A needs assessment alone won't ensure personalization. But it will provide a resource leaders can use to triangulate data and identify areas where teachers' needs or wants and students' needs align (and proactively address areas where they don't). At Mariana Bracetti Academy, principal Jana Somma and assistant principals Adrienne Davids, Andrew Boglioli, and David November keep notes throughout the year about professional learning topics recommended to them or needs that staff members express. They meet to share classroom trends and analyze observational data and invite teacher leaders to submit additional ideas for consideration. All suggested topics are then compiled into a staff needs assessment to determine which topics, formats, and times will best meet staff members' needs for the coming year. Of course, the needs vary based on grade level, content area, and years of experience. But this data provides leaders with valuable information to shape a personalized professional learning model that meets staff members where they are in their growth process. This teacher-centered approach has resulted in 85–90 percent teacher participation in the academy's personalized professional learning model over the past seven years. It enabled the school to offer innovative topics (like mindfulness) and blended-learning experiences long before they were commonplace. Too often, teachers sit in facilitator-centered professional development sessions in which the learning is done "to" them rather than have opportunities to dig deep into the content and strategies themselves in active collaboration with colleagues. 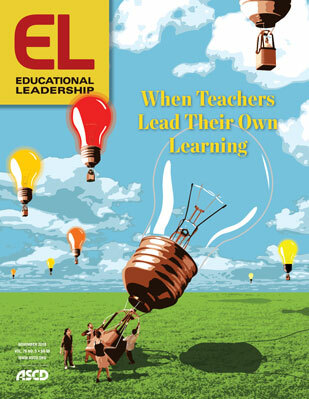 In true codesigned professional learning, teachers identify a challenge and the new skills or knowledge they need to tackle it, clarify how learning will be measured, and outline an action plan to achieve the desired results (Kallick & Zmuda, 2017).1 Educators must begin to design and build professional learning experiences that are sustainable and job-embedded. Experiences should be viewed as makerspaces rather than a lecture by an outside expert. In the same way that we construct teacher evaluation cycles to include both observations and feedback, we need to design professional learning experiences as an evolving loop of development. What happens after a face-to-face session or online collaboration is just as important—at times more important—than teacher engagement during the session itself. The codesign process should include skillful, learner-centered facilitation of the initial learning event and co-constructed action steps that will follow. Designers should answer questions like, How will the performance indicators (of learning) be demonstrated in classrooms? What are the teacher's next steps? What coaching or resources are needed to support teachers? One way to incorporate teachers as codesigners in professional learning planning is to match teacher leaders with sessions they can facilitate based on their strengths. Share needs-assessment data with teacher leaders, brainstorm approaches and strategies together, and trust in teachers' ability to facilitate high-quality learning experiences. The nature and scope of teachers' collaboration and learning tasks between sessions will vary widely depending on the group dynamics, depth and time commitment of the learning experience, and teacher readiness. Meaningful experiences to transfer learning might include journaling and self-reflection, examining student work and analyzing achievement data to see whether new strategies a teacher is attempting are improving learning, observing in classrooms, and audio/videotaping lessons or student conferences to review together later. For example, in a professional learning community focused on the whole child that I facilitated for Mariana Bracetti, initial content brainstorming took place with one of the school's counselors. From there, the PLC participants used whole-child indicators to self-assess the school's progress. This diagnostic work became the compass that directed the codesign of the rest of the PLC—where the group concentrated their time, the action plans they developed, and the transformations that took place in their classrooms. The focus was not on content delivery, but on finding a way to give "credit" for the real and meaningful work of professional growth. Twitter and Voxer chats, virtual book clubs, and discussion boards continue to take hold as popular forms of professional learning. While these formats transcend time and space constraints typical of traditional PD, they also include an important social component that cannot be overlooked. People build ideas through relationships with others. A range of digital platforms allow educators to widen their professional learning network beyond the four walls of their classroom and school to include a global collaborative. They have an opportunity to see firsthand—through videos, student interviews, and conversations with remote peers—how particular strategies and approaches play out in a variety of different contexts. This need for social construction has led to an explosion of ideas and resources on platforms such as Pinterest and Teachers Pay Teachers. The challenge for district and school leaders is to support and foster social construction while also maintaining quality control. Too often, materials and ideas that are easy to obtain (and, honestly, look good) don't necessarily result in student achievement gains. Some may actually do harm by being too low-level for students or misaligned to standards. Leaders have an obligation to create more spaces for interaction between educators (both face-to-face and virtual) that promote high-quality, innovative practices that will truly move the needle on student achievement. Some leaders, like Eric Ewald from Iowa City Community School District, have designed socially constructed learning opportunities such as "Pedometers and Podcasts," in which educators can get some steps in while listening, via podcasts, to voices beyond those they hear within their school. Ewald provides a list of recommended podcasts, but teachers also select their own to glean ideas. Teachers then connect with one another to discuss how the ideas might apply to their teaching contexts. School leaders need to design learning spaces that better support the complete learning loop—spaces in which participants are not just consumers but also producers, co-constructing exceptional instructional designs together. For this to happen, we need to become comfortable with expanded definitions of leader and facilitator. Any colleague who pushes our thinking in new ways is qualified for a leadership role—regardless of experience. The challenge will be moving beyond monitoring a space that houses easy-to-produce, easy-to-consume materials to co-constructing a space that helps teachers exchange their most results-oriented, innovative ideas. The fourth attribute of personalized learning is self-discovery—the process of students coming to understand themselves as learners. Self-reflection is an integral component of high-quality professional learning. Kallick and Zmuda say learners should "reflect on the development of ideas, skill sets, knowledge, and performances … this helps them envision what might come next as well as what they might do next, explore next, create next" (2017, p. 4). As technology (and learner preferences) have evolved, reflections have become more audio- and video-centric. Part of what makes platforms such as Google Hangouts and Flipgrid popular is their real-time and mobile nature, but more powerful is their ability to connect participants face-to-face even if these learners' experiences are asynchronous and on different continents. The notion of a "thought partner" has progressed beyond paper-based journals and direct conversations. This has implications not only for the breadth of one's learning community, but also for the depth in which learners can connect, empathize, and problem solve together. The very nature of reflection has come to be recognized not just as a solo activity, but also as a collaborative one built on trust and mutual respect. Leaders can respond to this evolution by offering multiple approaches and formats for teachers to reflect and continue the learning cycle. Finding the right platform can be a juggling act. Mariana Bracetti piloted four learning management systems before settling on one for their blended professional learning opportunities—and the reality is that not a single platform they considered received exemplary reviews. When it comes to self-discovery, the true cornerstone is providing choice. Envisioning the future of personalized professional learning requires that we strip away antiquated notions of one-size-fits-all, "sit-and-get" professional development, but it also demands more than just teacher voice and choice. Truly empowering teachers through personalized professional learning requires us to reimagine the time-space continuum of learning and envision one which isn't bound by school hours and district buildings. Teachers don't want to be passive receivers of "best practices," but codesigners on a journey of professional self-discovery. As Mariana Bracetti assistant principal David November asserts, "Personalized professional learning affords teachers the opportunity to take ownership of their growth. This ownership is ultimately what sparks creativity, ignites teachers' passion, and creates lasting change." › Rodman states that while differentiation and personalization are now common in K–12 classrooms, teacher PD still tends to be one-size-fits-all. Why do you think this discrepancy persists? › What aspects of personalized learning could you introduce to PD offerings in your district? What challenges stand in the way and how could they be addressed? K–12 Education Team. (2015). Teachers know best: Teachers' views on professional development. Seattle, WA: Bill and Melinda Gates Foundation. Kallick, B., & Zmuda, A. (2017). Students at the center: Personalized learning with habits of mind. Alexandria, VA: ASCD. TNTP. (2015). The mirage: Confronting the hard truth about our quest for teacher development. New York: Author. 1 Kallick and Zmuda use this definition of codesign as an attribute of personalized learning. While their work focuses on students' learning, these qualities of codesigned learning would seem to apply to teachers' learning as well. 2 Teachers receive continuing education hours credit toward certification for the action steps they take between each session. Allison Rodman is the founder of The Learning Loop, which provides professional learning services to districts, schools, and education nonprofit organizations. Follow her on Twitter.